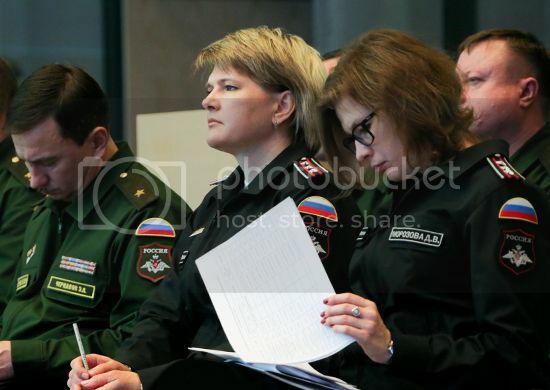 Since the defence minister Shoigu introduced the new "office uniform" in the late Summer of 2013, the civilian workers of the Russian Ministry of Defence have been obligated to wear such a uniform as well. 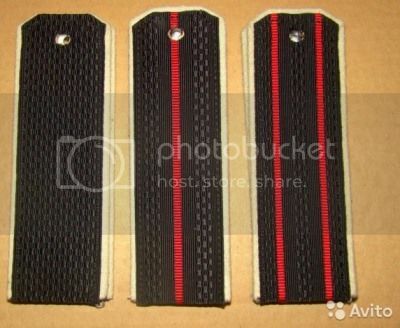 Their civil category (grade) is reproduced on the shoulder boards just like the military ranks are. do every single non-military employee of the ministry (such as for example cleaners) fall in this category or is it only certain type (like upper echelon office worker) ? the reason I ask is that ranks do not seem to include NCOs. 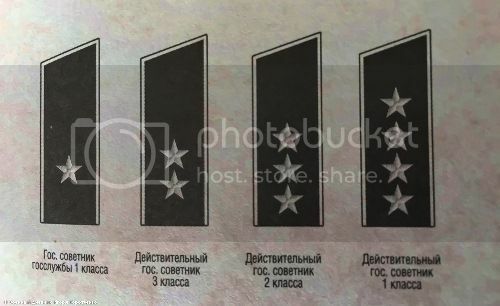 12 and 13 are equivalents not to Ensign (since Ensign is a Commissioned Officer's rank) but to Warrant and Chief Warrant Officers, which equal to Russian Praporschik (прапорщик) and Senior Praporschik (старший прапорщик). 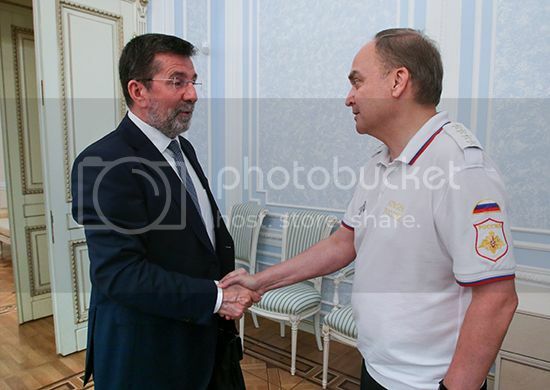 прапорщик means ensign doesn't it? Although I suppose the normal translation into Englis is warrant officer. 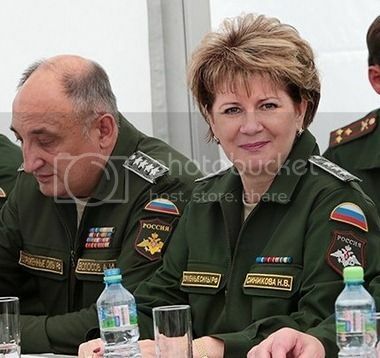 Luke2 wrote: прапорщик means ensign doesn't it? 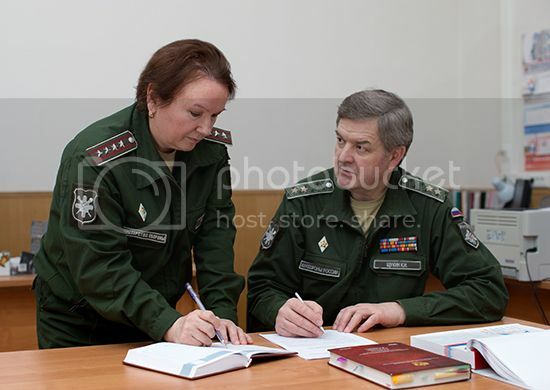 Although I suppose the normal translation into Englis is warrant officer. 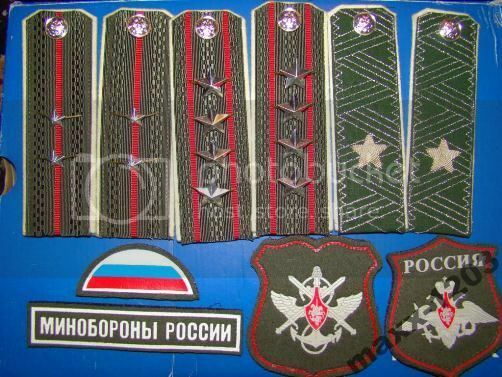 For the Russian Imperial Army yes - прапорщик was the first CO rank and could be translated as Ensign or Third Lt. 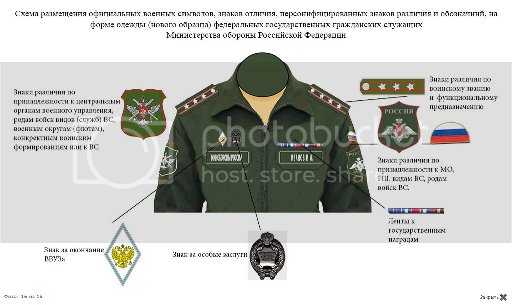 But when it was implemented into the Soviet Army in 1971 functionally it was equivalent to the Warrant officer not to the CO.
and "polo t-shirt style uniform"
Well, the pure heritage of the Russian Imperial Ranking of Civil Officials. 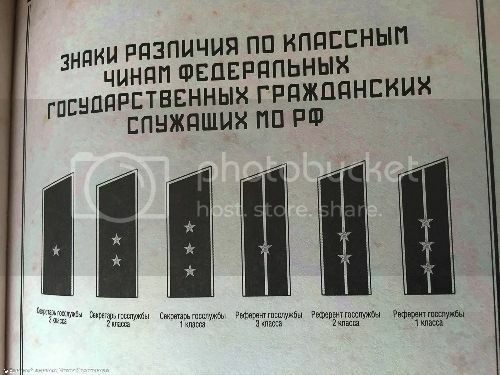 Such ranking system concerns not the Ministry of Defence only but most of other - civilian - governmental institutions. 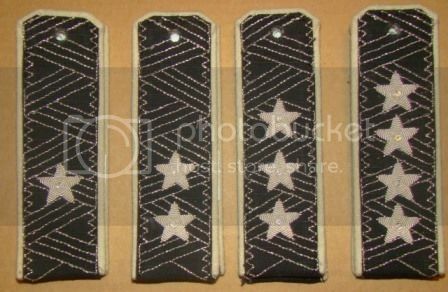 The rank insignias seem a litte inflated. 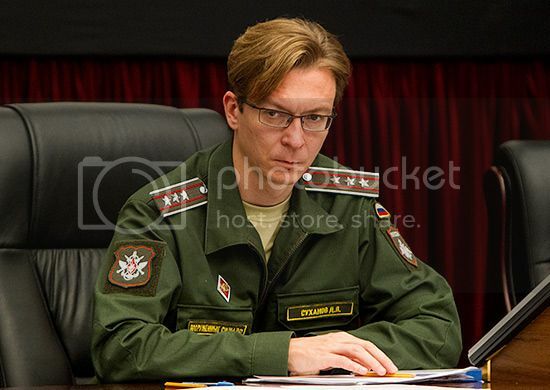 State councillor first class (equivalent of colonel) wears one big star like a major-generl. There are other examples, too. 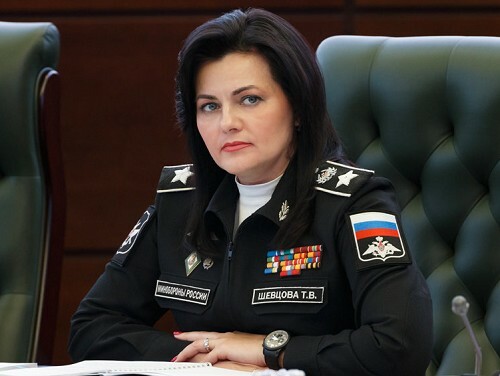 Tatiana Shevtsova, the deputy minister of defense wearing the shoulder insignia of the Actual State Councillor of Russian Federation, 1st class (holding the position of the Army General). what does "actual" means in this context ? Back when (XVIII-XIX c.) there were the "actual" counselors, secretaries, etc. and the "titular" ones, i.e. those weren't actually working as such, only got the title of the job ... e.g. you had an "actual privy counselor", who advised the monarch whenever required and some high-ranking civil servant who was a privy counsellor only in title, not in actuality. This was mostly the German, Austrian, etc system, introduced by Peter I. when he reformed the Russian State. As an aside, even today in many countries there are judges sitting on low-level courts who hold a higher title (like titular judge of appeals, actual first-instance judge). 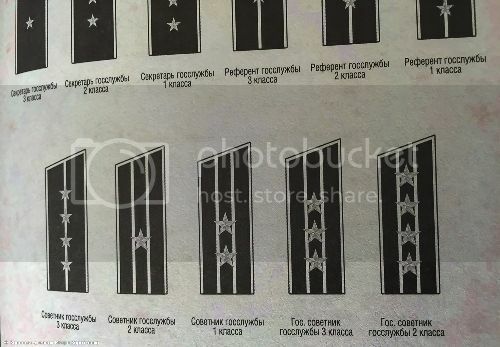 Very interesting material about the proposal of uniform and insignia regulations for the civil workers of the MOD. It's not approved yet.